Newegg, the leading electronics e-retailer in the United States, just stepped up its game by partnering with the payment processor BitPay to start accepting Bitcoin. After hinting at the possibility more than once in the past, the major electronic retailer finally decided to accept the world’s most famous cryptocurrency. Starting this Tuesday (1st July), the company’s more than 25 million registered customers can buy one of the 10.5 million products sold by Newegg using their BTC savings. The decision was particularly justifiable since “Newegg’s customers are among some of the earliest Bitcoin miners and are enthusiastic proponents of the cryptocurrency”, explained Soren Mills, chief marketing officer for Newegg North America. The partnership between Newegg and BitPay not only guarantees the company can accept Bitcoin without any hassle, but also makes sure the e-retail giant is able to handle BTC refunds and payment exceptions with “the most powerful Bitcoin API in the industry”. “Our mission is to make Bitcoin every merchant’s favorite form of payment. Forward-thinking merchants like Newegg allow Bitcoin enthusiasts from around the world to shop with ease. Newegg has been the most requested retailer from the Bitcoin community and our collaboration will serve this pent-up demand”, said Tony Gallippi, BitPay’s executive chairman. If the customer has digital wallet software installed, that customer can complete an order by clicking the “Pay with Bitcoin” button. If the customer’s digital wallet is stored in a smartphone, a QR code can be scanned on the Bitcoin Payment page to complete the transaction. If the customer’s digital wallet is hosted on the web, the customer clicks the “View Address” link to display the digital wallet address and send the Bitcoin amount due. 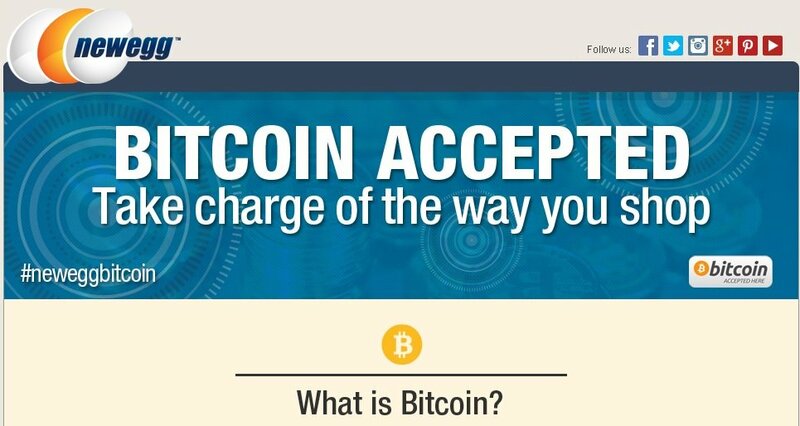 The process is pretty straightforward, but if you need more information then visit Newegg’s webpage dedicated to Bitcoin.